With Price List extension you allow customers to download price lists without your assistance. With this extension you won’t have to manually create price lists since it creates them automatically. You only need to make a few clicks to add downloadable price list as a widget. This widget can be placed anywhere on your website. It’s a really convenient way for customers and retailers to get your price list. You can put it anywhere on your website. There can be a unique price list with all prices for all products or separate price lists for different categories. You can select attributes for export and exclude some categories that you don’t want to show in the pricelist. Place icons anywhere on your website using default Magento widget. 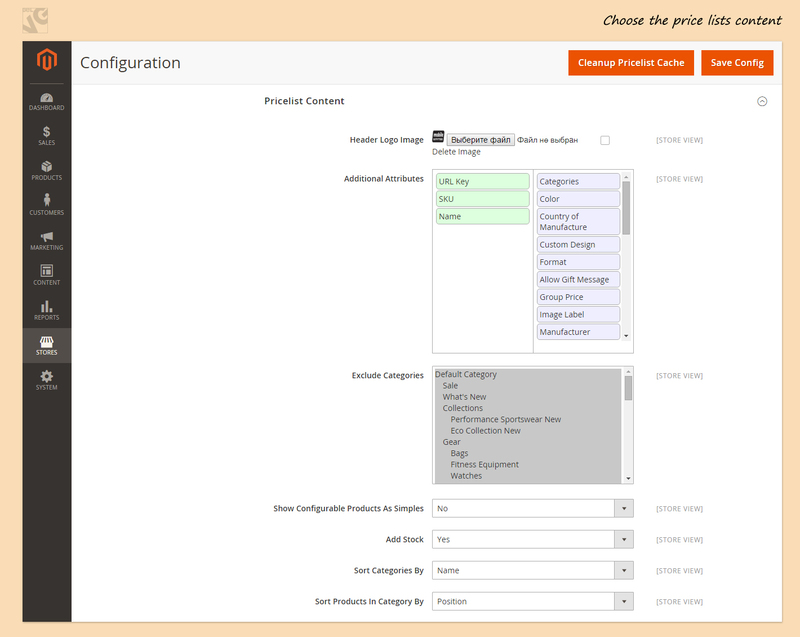 Navigate to Stores –> Configuration –>BelVG Extensions –> PriceList. Here you can enable or disable the extension. Also, here you can select Customer groups that will be allowed to download price lists from your store. You can select all groups here or just some of them. Header Logo Image – upload logo image that will be displayed in price lists header. Additional Attributes – drag and drop attributes that you want to include in pricelists. 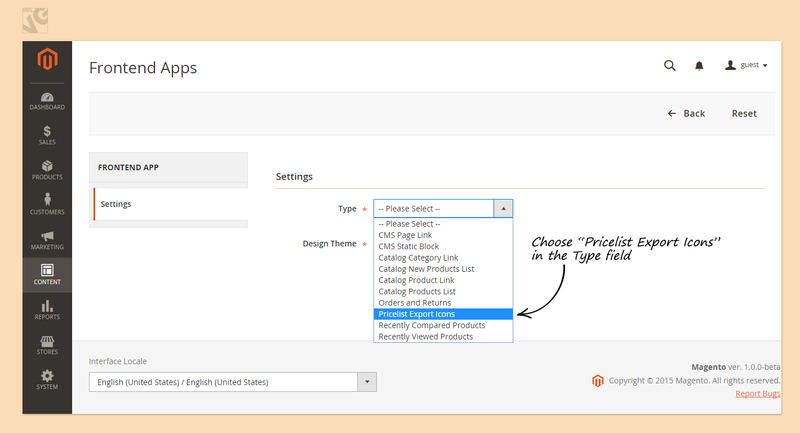 Exclude Categories – select the category that you want to exclude from your price list. Show Configurable Products as Simple – this option allows dividing configurable products into simple ones. Add Stock – allows adding stock field where the quantity of items left in stock is displayed. Sort Categories by – allows sorting categories in price lists by name or position. Sort Products in Category by – allows sorting products in category by name or position. Price lists icons can be added on your store using a default Magento widget. This gives you a possibility to place your Download Price List icons where you want. 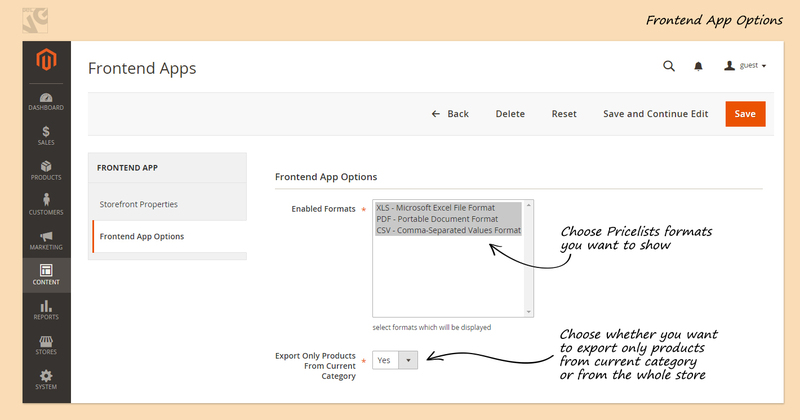 Navigate to Content –> Frontend Apps and Press Add Frontend App button. In the Type field select Price List Export Icons and in Design Theme field select the theme that you are using and press “Continue”. Then you can configure your widget and define the place where you want to display it on your store. After that go to “Frontend App Options”. Here you can select Price Lists formats: .XLS, PDF or CSV. 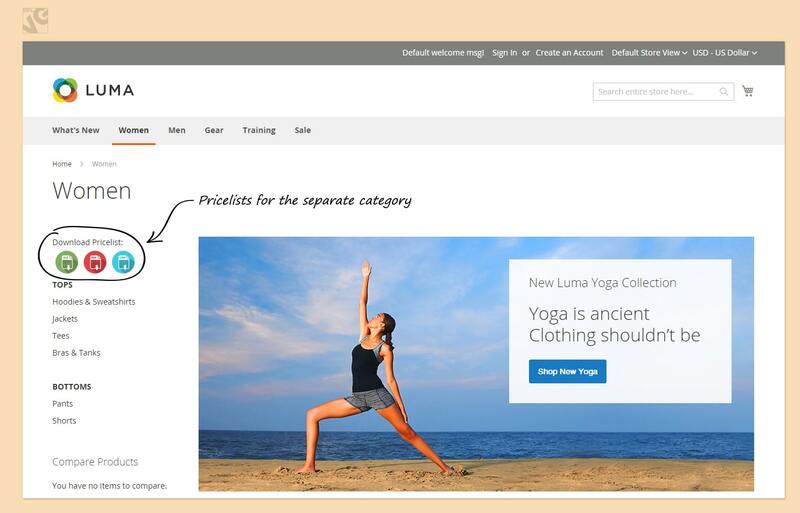 And define whether you want to display the price lists for the whole site or for current category. After you configured all settings, you can display your widgets on your website. 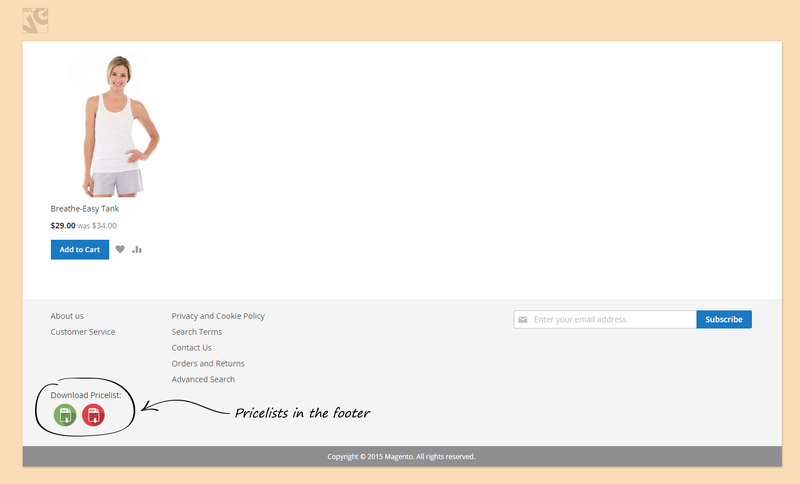 In this example we placed downloadable Price List with all prices in footer. In this example you can see the price list for current category. Here you can check how the price lists looks.